The drone laws in the US are pretty user-friendly. In this article, you’ll learn what you need to know. Before you can fly with your drone in the US, you need to register your copter with the Federal Aviation Authority (FAA). The registration requirement applies to both private and commercial drone users. However, commercial pilots must pay a $ 5 processing fee. After completing the registration, you will receive a number for your drone that you need to attach to your aircraft. Maximum Altitude: The maximum drone altitude is not defined in the United States for home users. There used to be a limit of 121 meters (400 feet). It is advisable to orient yourself at this limit. For commercial users, differing rules apply. Maximum horizontal distance and FPV: Multicopter must always be operated in sight. FPV is possible with a spotter, as long as this visual contact holds. Compulsory insurance: There is currently no mandatory insurance in the USA. Nevertheless, you should always protect your flights accordingly. We have collected detailed information on drone insurances here. Maximum take-off weight (MTOW): Private pilots may take aircraft up to a mass of 25 kilograms into the air. The above-mentioned registration requirement exists from a starting mass of 250 grams. Distance to airports: At airports, a distance of 5 miles (8,047 meters) is required. Other safety distances: Further safety distances in the USA do not exist as far as I know. Flight bans: Flight bans apply in all national parks. Also, you can not fly in Washington and New York City. Operating Times: Drones may only be used during the day and at dusk. Specifically, this is the time from 30 minutes before sunrise and 30 minutes after sunset. Special regulations: At present, the rules in the individual states or even cities may differ from the laws at the federal level. You should also check the local regulations during a USA trip. For example, New York City prohibits the use of drones completely. Exceptions are only possible for TV stations. The maximum allowed speed of the drone is 160 kmh (which is more than sufficient). Rules for Commercial Pilots: If you want to upgrade a copter for commercial use in the United States, you will need to take a test and qualify for a Remote Pilot Certificate (there are preparation materials here). 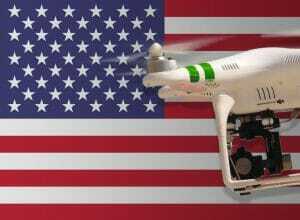 We have researched the listed drone regulations for the USA to the best of our knowledge. We cannot guarantee the correctness of the information. If you want to be on the safe side, contact the competent aviation authority. Alternatively, you can also ask the embassy in your country for further information about the regulations. Please leave us a comment when you receive news and/or gain experience with your copter in the United States of America! re Flying drones at night: The FAA specifies 30 minutes before sunrise and 30 minutes after sunset for commercial drone pilots (107) but not for recreational pilots. This video insists that hobbyists can fly at night IF they maintain VLOS at all times: https://www.youtube.com/watch?v=yZM1m9o5Ars I have three very powerful strobe lights on my Mavic Pro that enable me to see it easily — and I live in such a rural area that there’s almost no chance of my flying over people. Your blog is excellent, and I envy your ability to travel around the world. I am seeking registration to fly in the US as an Australian Tourist, however the process seems to only allow US residential and mailing addresses? As a licensed Drone Pilot in France, do I have to take the FAA 107 in USA to fly commercially or just follow their rules.